Andrea Reinkemeyer, Assistant Professor of Music, and her daughter Kaisa, reading Louise, the Adventures of a Chicken,by Kate DiCamillo, illustrated by Harry Bliss. 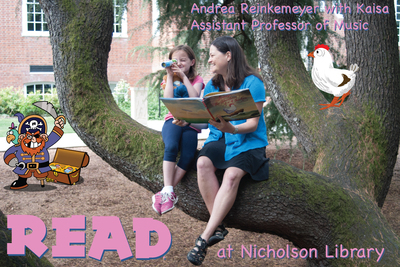 Armstrong, Lige and Nicholson Library Staff, "Andrea Reinkemeyer and Kaisa READ Poster" (2015). READ Poster Gallery. Image. Submission 150.